Google Similar Images is an experimental service from Google Labs that lets you find images that are similar with an image you select. 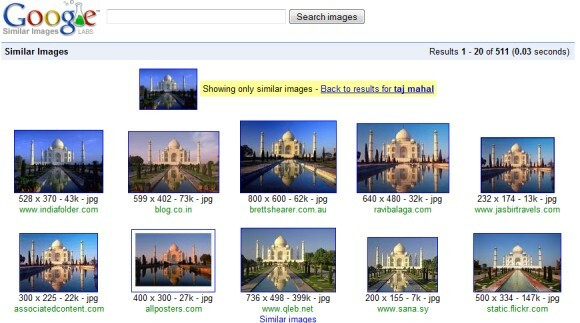 "Similar Images allows you to search for images using pictures rather than words. Click the Similar images link under an image to find other images that look like it." The interface doesn't perform real-time image analysis, so you can't upload images. 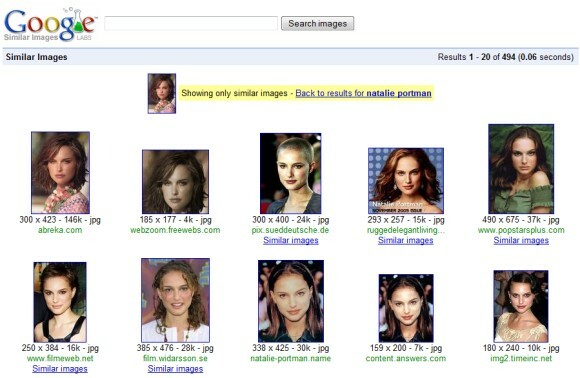 Instead, Google lets you search the web for images, choose one of the results and click on "Similar images". The results are surprisingly good and this is probably the most impressive feature ever released by Google Image Search. Google also launched a new interface for Google Labs that categorizes the experiments, lets you sort the services by popularity, post comments and subscribe to a feed of the most recent services. What a ripoff of TinEye! Its about time! I agree that this is their most impressive image release feature. It really works surprising well and is not a ripoff of Tineye. Tineye finds the exact image or portion of the exact image on other sites. Google's new feature looks for similarities and likeness to the original, not an exact copy (although, it does find exact duplicates as well). To me, this is much better than the similar function in MS Live Image search. That one seems to utilize the query string much more heavily vs. actual image analysis. So, I'm glad to see Google doing the real difficult work of image analysis with this offering. It seems to blend the actual image attributes with the query string. So, for a pic of Michael Jordan, you will sometimes get images that look just like the original and sometimes, you will see Air Jordan shoes. I would like to see an option to limit the results to image similarity only (and exclude exact duplicates) - regardless of the name or query string. I wonder how often they analyze and which images are chosen for analysis. I'm glad to finally see their image search getting some more functionality. Other services were starting to catch up and surpass it. I think it now has the lead again, but it could still use a minor UI overhaul to make it a little more intuitive and dynamic (ie. infinite scroll) for discovery and exploration - kind of like Picasa Web now has. Well, first of all, as Que says, it's not a ripoff of TinEye. I'd add, for the record, that TinEye finds not only exact matches or portions of the submitted image, but also modified, as in skewed, rotated (not available on the site but the engine can do it), and even with some photoshop editing. They have a pretty nice gallery of "cool searches", and if you choose to sort them by "worst match" you can get an idea of how powerful it is. That said, just as there was a need for TinEye (it's very useful for artists and photographers to find unlicensed uses of their work, which makes it sort of a Copyscape for images), the less restrictive similarity search was very much needed, especially for when you have an image in mind but can't recall the correct search terms to find it (this would be ideal with an upload feature, from file or by url, but it's already great like this). And quoting Que again, MS's similar image search was a step in the right direction, but just didn't cut it. I'm really happy with this and am very much looking forward for more developments in this regard. "and even photoshopped versions of the images"
Oh, and I forgot to mention: another cool way to search for images (especially when you have something in mind but no reference image to upload or provide the url) would be making sketches that would then be matched with other images. This has already been implemented some time ago, for flickr images, with Retrievr. Heh, I thought I'd stump it with drawings that were too simple, but try 'XKCD', and it finds any black-and-white stick figure comic on the web! That would be incredibly useful. As it is right now, I don't see the point. Technologically cool. But very few real uses. Wow. That's really great to know i will try this. And hope this will work properly and it will be user friendly too. AltaVista had this years ago -- then it went away. I'm thinking the Google one might be using the input of Google Image Labeler, at least in part, for the "similar images" results. I think AltaVista's was purely visual (algorithmically). But I'm just guessing here. this is on of the best promotional video i ever seen. google always come up with new ideas which are 100% Out of the box. Every time they redefine. Its great. I think it will helpme alot. I am in the line of photography. This is pretty interesting and maybe in the future we will be able to take the multiple images and maybe morph them into a 3 dimensional image. Another home run from google. Are the searching for similar images through on page image context or is their spider able to analyze actual images in the pictures? It's funny because it's the same laptop.